The Type of button. You can choose Circle, Square or Rounded Square. Controls the button color of the button. Controls the button color when you hover the mouse over the button. Controls how transparent the button and arrow is. Note that Opacity controls the Button and Arrow equally. Controls how transparent the button and arrow is when you hover the mouse over the button. Controls the color of the arrow. Controls the arrow color when you hover the mouse over the button. Controls the style of Border. Choose from: None, Dashed, Dotted, Double, Groove, Ridge, Solid, Inset or Outset. Controls the color of the border. 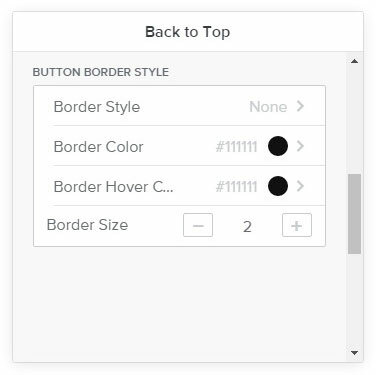 Controls the border color when you hover the mouse over the button. Controls the thickness of the border. 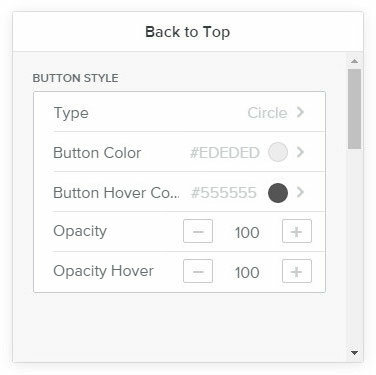 The position setting allows you to position the button on the page either to the Left, Center or Right. Controls the size of the button. Minimum 30 pixels and maximum 80 pixels. Controls the space between the button and the bottom and sides of the page. Controls where the button appears, from the bottom edge of the page. The z-index setting specifies the stacking order of an element. A larger stacking order number is always in front of an element with a lower stack order number. 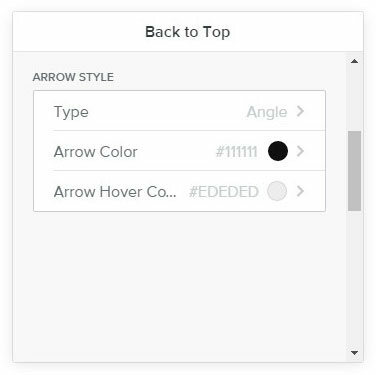 This setting allows you to control when the button appears on the page. The default setting is 300 pixels. 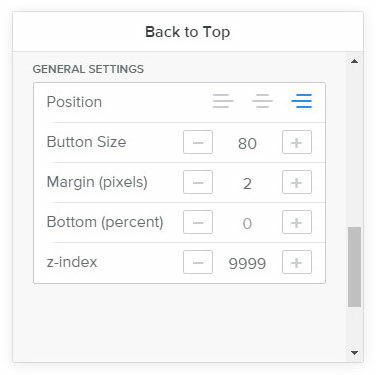 In other words the person would have to scroll down 300 pixels before the button appears. Controls the amount of time the button takes to become visible. Controls the amount of time it takes for the button to disappear. 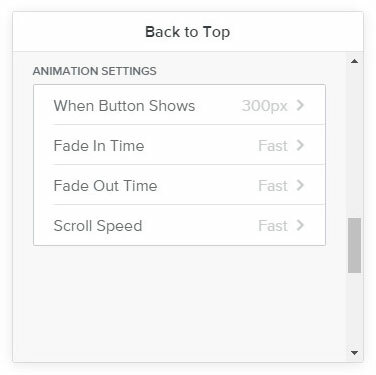 Scroll Speed controls how fast the page is scrolled to the top.